Guitar Jar Magazine Shop are delighted to offer the excellent The Big Britpop Guitar Chord Songbook. With so many available these days, it is great to have a make you can trust. The The Big Britpop Guitar Chord Songbook is certainly that and will be a excellent purchase. 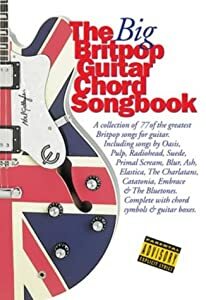 For this great price, the The Big Britpop Guitar Chord Songbook comes widely respected and is a regular choice amongst lots of people. Wise Publications have provided some excellent touches and this equals good value. Seventy-seven of the greatest Britpop songs arranged for acoustic guitar, including full lyrics, guitar boxes, guitar symbols and full lyrics.